From DFW Metroplex: From Interstate 20 take Exit 453B to TX-360 South. Continue South to Ragland Rd. Turn Left on Ragland Rd., park entrance is on your Right approximately ¼ mile. Park staff at Gatehouse will direct you to launch site. From South of DFW Metroplex: From US 287 take TX-360 North for 6 miles to Ragland Rd. Turn Right, park entrance is on your Right approximately ¼ mile. Park staff at Gatehouse will direct you to launch site. This 4.9-mile trail offers a spectacular outdoor experience for nature lovers, outdoor recreation enthusiasts, families, and paddlers of all skill levels (children should be accompanied by an adult). Once you reach the HWY 360 overpass, turn around and enjoy the lazy current and prevailing southerly wind on your paddle back! Joe Pool Lake has fair populations of white bass, crappie, and largemouth bass. White bass and crappie can be caught using jigs and spoons attached to medium and light action fishing equipment fished in open water and close to bridges. Largemouth bass can be caught using medium to heavy action fishing equipment using soft plastics fished around aquatic vegetation and standing timber. Starting from the shores of the lake in Loyd Park, this 4.9 mile trail crosses a bit of open water, takes you past two islands, and up the winding, shaded waters of Walnut Creek. Along the way you will experience flora and fauna that you might not readily associate with life in DFW. This area is located at a crossroads (ecotone, or edge) between the Blackland Prairie and the Eastern Crosstimbers ecoregions. As a result, there is a diverse mix of plants from both ecoregions found here. This trail offers excellent opportunities for bird watchers, including water fowl, herons, osprey, hawks, songbirds, and more. Bobcat, beaver, foxes, coyotes, raccoons, possum, rabbits, and many other mammals are spotted on a regular basis. Turtles, frogs and other aquatic life abounds. Fishing along the trail is some of the finest that Joe Pool Lake has to offer. For more information please see the Paddling Events calendar or visit the Grand Prairie Parks & Recreation Department website at www.GrandFunGP.com. On the west shore of Joe Pool Lake, Loyd Park covers about 791 acres of native Texas landscape. Centrally located, camping at Loyd Park is conveniently close to the major DFW attractions - in a peaceful tree filled setting right on the lake. Individual campsite sizes are large (average of 1000 sq. ft.) and each one has a picnic table and pavilion, grill, fire ring, and more Texas tranquility than you can handle! Other amenities include cabins for rent, a meeting cabin, large group pavilions, hiking & equestrian trails, boat ramps, restrooms & showers. 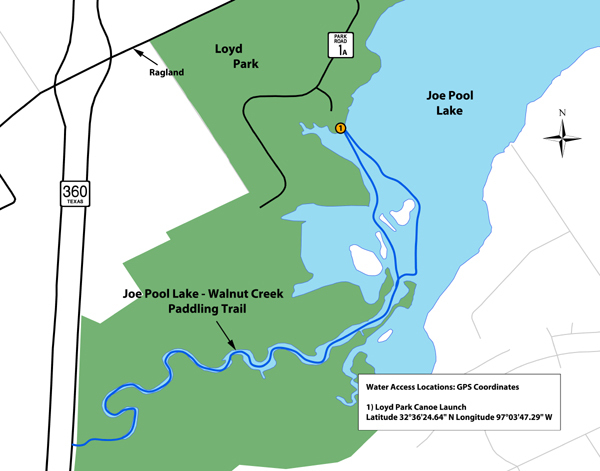 On the northwest shore of Joe Pool Lake, Lynn Creek Park covers about 784 acres. Park amenities include a white sand swimming beach, playground, restrooms, two boat ramps with eight lanes, a concession stand, almost 100 picnic sites, group picnic pavilions, and a sand volleyball court. This trail was made possible through a partnership between Texas Parks and Wildlife Department and the City of Grand Prairie Parks & Recreation Department- Lake Parks Division. Offers kayak and canoe rentals, also guided trips and paddling instruction. Only available for groups of 12 or more with advance reservations.